The room the kingdom of our children and must be able to guarantee them a functional and well organized in the various stages of growth. 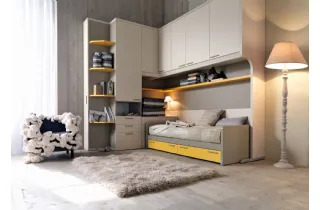 The Doimo Cityline bedrooms, with new modular and modular systems according to space needs and personal taste, they offer to children and young rooms in which to play, study and cultivate their passions in harmony and security. Bed compositions bridge, loft beds, bunk beds, beds equipped, pull desks, wardrobes, modular cabinets, corner cabinets, space-saving furniture, angled bridges, beds vagone.Qualsiasi is your need, definitely c a darredo Doimo Cityline solution for te.La bedroom potr then be customized by choosing from a variety of materials and finishes with a practically unlimited possibilities of composition. Many creative ideas to design and furnish the junior space in a dynamic and multi-faceted way, always in step with levolversi of taste and furnishing trends. 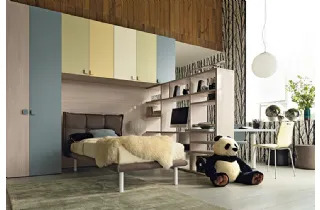 The child's bedroom created and produced by Doimo Cityline are numerous. Because the goal is to satisfy every request and requirement. From the most discreet to the most vivid, the quality remains the same that joins a structural completeness of which is confirmed every day. 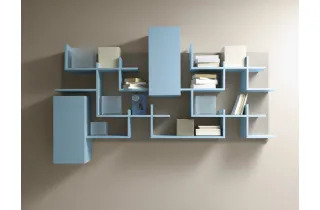 In the realization of the cupboards for children's rooms Doimo Cityline nothing left to chance. The structure can accommodate the wardrobe and all personal belongings of the young people, allowing you to maintain the environment in order and at the same time preserving unimmagine appealing. The beds for children rooms designed and manufactured by Doimo Cityline are ideal for people who understand the importance of creating an atmosphere serene and cozy during the early years of children's lives. The different models meet every need and always-filled structure of a total quality. In a deck of Doimo Cityline bedrooms organized space so you can do everything in the best way: to study, sleep, relax, play. The elements that compose them are qualitatively reliable and also original, which often focus on trasformabilit and versatility. Wide and versatile selection of signed for bedroom Doimo Cityline desks that are able to adapt to any space, even in the case where the size is reduced. Wide shelves or desks estraibilii: ergonomics, solid and safe materials, careful design for desks of our children. The libraries for children's rooms, they perform a containing function-filled dellefficacia and solidity. At the same time they represent an important element in defining the style chosen for the decor. Doimo Cityline fielding an offer varied and versatile.